The KTM Redbull MX Team have once again put in some impressive performances here on our home soil despite losing 2018 Champions Jorge Prado and Jeffrey Herlings to injury. Tony Cairoli has picked up where Herlings left off last year by propelling himself to the top of the early championship standings. 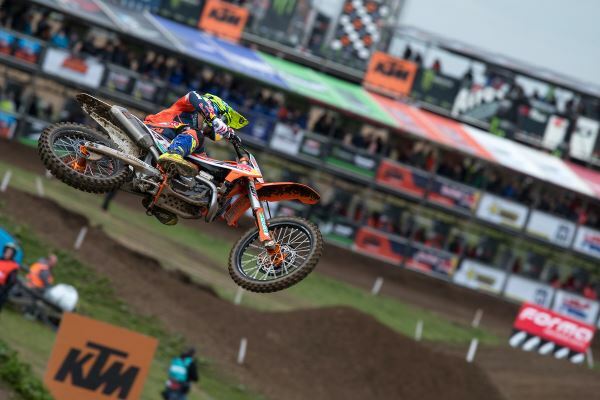 Last weekend, Cairoli backed up his success in Argentina by taking the win as the 2019 MXGP Championships landed at Matterly Basin in Hampshire. Track conditions were perfect, allowing Cairoli to set the early pace aboard his KTM 450 SX-F. But a mistake during the last lap of qualification denied Tony his first qualifying win of 2019. Not to be deterred, Tony took to the track on Sunday and took advantage of a mistake by Tim Gasjer to win the first moto. In the second race of the day, Gasjer took the win but Cairoli was within a whisker and the 1-2 finish was more than enough to take the overall win. In MX2, Tom Vialle took to the Matterly Basin track for just his second race aboard the KTM Redbull 250 SX-F. Tom proved his talent on the very first corner nabbing the holeshot and eventually running in 3rd. In the second race, Vialle maintained the lead for almost half the race, but he eventually succumbed to the expertise of the more experienced overall winner Thomas Kjer Olsen. With teen sensation Jorge Prado sidelined, Tom Vialle has had to pick up the slack for team KTM Redbull in the MX2 class. Good work Tom! KTM’s MX success is down to putting the best riders on the best bikes! And as the UK’s only premium KTM dealer, we’re able to put all our customers on the very same KTM MX machines. The KTM MX range including the championship winning KTM 450 SF-X and KTM 250 SF-X are available to order from our Tewkesbury showroom or online here. We also stock a huge range of official KTM PowerParts for the entire MX range as well as official KTM PowerWear so you look the part whilst you’re tearing up the competition.